Whisk together the flour, baking powder, baking soda, and salt in a medium bowl. Set aside. In a stand mixer fitted with the paddle attachment, beat the butter over medium speed. Add sweetened condensed milk and beat until fully combined and fluffy. Reduce mixer speed to low and slowly add the flour mixture, 1/2 cup at a time, stopping to scrape down the sides of the bowl if need be. Continue to mix until it is all incorporated and the dough is smooth, about 1 minute. Fold in the chocolate chips, peanut butter chips, and pretzel pieces by hand with a rubber spatula. Line a baking sheet with parchment paper. Form 1-inch balls and place them at least 1-inch apart on the baking sheet. Bake for 10 to 12 minutes until the bottoms of the cookies are lightly browned. Remove from the oven and let cool. For an extra treat, you may drizzle cajeta or dulce de leche on top. I made these this week and my husband said they were wonderful! His favorite store bought cookies are pecan sandies and he said they had similar texture . I added butterscotch morsles and pecans. He liked them so much that he insisted on taking some to work and sharing them ! So happy to hear this, Brenda. Thank you for sharing! I just made these for my husband’s birthday today. I made exactly as written with p.b. chips, pretzel pieces, and dark chocolate chips. When I saw Pati make these for Juju on her program, I knew I had to try them. She has such a beautiful connection to her three sons. I get teary eyed watching her intertact with her cute family. The cookies were wonderful! They were not too sweet (thankfully because sweets in the United States are far too sweet for my taste). Watching Pati make these just made me happy. I hope to discover as much joy as she has each day. I watch her cooking show to learn new food ideas and techniques, but more especially for a mood boost. These look delicious…..any idea what the sugar content is? thanks…. Oh I don’t keep nutritional information on the recipes…but enjoy the cookies, Stan! Hola pati ise las galletas y estan riquisimas. Ami familia les encantaron. Ahora quieren que les aga el sandwich favorito de Sammy. oh Pati. i made these today. i love these cookies. But how do i store them??? You can keep them in an air tight container, Bobbie. Hi Pati, I was watching you make these cookies on Create TV and thought that this would make a great recipe for a family member who is allergic to dairy, eggs and peanuts. I would need to modify the recipe a little like using non dairy butter, soy based condensed milk and dairy free chocolate chips. Because I plan to leave out the peanut butter chips and pretzels, do you recommend that I adjust the amount of the other ingredients so that the cookies still turn out good? Thank you and I enjoy watching your shows! 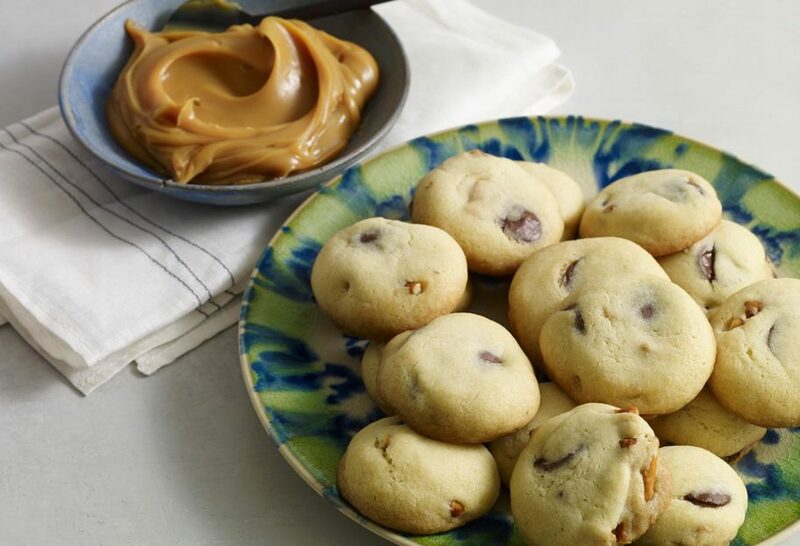 Hmmm, you might want to try these cookies, which you can make using vegetable shortening: https://patijinich.com/recipe/mexican-wedding-cookies/ Enjoy Joanne! !Mil gracias! Just made these cookies with my grandchildren. So fun and so delicious! Yay! So happy you had fun in the kitchen with your grandkids, Ramona. Oh my gosh….so darn GOOD! Saw this episode and had to make these as soon as I could. They are delicious. Of course, I’m sure the 3-1/2 sticks of real butter and a can of condensed milk have something to do with that lol! Love your show and have both of your cookbooks, Pati. I have made several of your recipes and have been pleased with all of them. Keep up the good work, girl! Thank YOU Michele for trying my recipes…and for loving them! I was hesitant to make these cookies because I live in a high altitude area (greater than 6000 ft), so I made half a batch. These cookies turned out awesome! They were so fluffy which is hard to achieve at our altitude. Are these the cookies you brought to a boy friends home where his father said you must marry her? Oh! That’s the Mango Tart! Oh that’s so great! I love your personal stories and especially that one. Thanks for keeping it REAL. Hola from Manila, Philippines! 🙂 I also saw your show and made the cookies over the holidays Janet (also from the Philippines) mentioned. They tasted really good and didn’t last an hour. 🙂 but mine turned out very flat and soft though. And my pretzels were a little soggy. I baked them right away. Was my butter too soft perhaps? How do I retain the crunch in the pretzels? That is strange… They do lose the puff shortly after coming out of the oven, but I like that about them. And the soft pretzels…. hm. Did you cover the cookies right after baking? Try letting them completely cool before covering. Maybe that will do it! I truly enjoy your show, but most of all love the pleasure you get in cooking for your family. I always tell my daughter, Luna, that I want her to have memories of me cooking for her. I’m going to make these cookies for Halloween…they will surely be a hit. Mayra, I couldn’t agree more. Family is the most important!! I’m sure Luna will love making the memories with you even more than the cookies themselves! Thank you so much for trying the recipe and for taking the time to write to me! I have been watching your show on Create TV since you started. I have seen your show evolve from a somewhat shy girl to a confident and very talented young lady. I just LOVE all your recipes!! I just made these cookies for our women’s Bible study tonight and I must admit, I was a little scared when I tasted the uncooked batter and cringed a little. (I love to lick the beaters! hahaha). Even my grand daughter gave the batter a thumbs down. But…after these cookies were done, I was AMAZED at how good they were!! So light and fluffy and soooo good!!! My grand daughter is eating them faster than I can take them out of the oven! I am sure they will be a big hit tonight, if they make it through the next 4hrs without getting eaten! Thank you again! PS. Your zucchini soup is one of my FAVORITE recipes!!! Even though I cannot find the right cheese for it. I just put Queso Fresco and it comes out wonderful! Kathleen, I am so thrilled the cookies turned out well!! I hope they were a big hit. =) Thank you so much for trying the recipe! I made this recipe with gluten free Namaste flour and it turned out great. I have a grandson with celiac disease and an allergy to eggs. This recipe will allow him to have treats like the rest of his 6 year old friends at school. I did sift the flour before measuring and chilled the dough for about 1 hour before rolling them and baking them. Thank you! Hola pati llo no tengo un stand mixer queria saber if I can use a hand mixer para aser las recetas? I just made these for a church bake sale. I’ve never used sweetened condensed milk before and wondered how they’d taste without any sugar in the recipe. Well, the cookies are super-sweet and the peanut butter chips and pretzels balance the dough out nicely, so I’m glad I didn’t substitute other sweeter ingredients! Thank you, Pati, for a quick and yummy cookie recipe! Thanks for getting my cookbook, I hope you enjoy everything you try from there! I also hope you like this homemade cookies…. they are great with coffee or tea on the side. Quiero saber i puedo reemplazar la harina con gluten free flour. Thank you for this wonderful cookie recipe. It is soooo good and easy to make. My grandkids are going to love. Also, love your cooking show. Just made this recipe, and it turned out well. My grandson cannot eat eggs, so thought it would be a perfect choc. chip cookie recipe for him. Thank you so much.